We called the Shelby-built 2011 Shelby GT350 "one pudgy new Mustang" and the same holds true for the 2012 Shelby GT350, which adds a convertible top, two new colors and nothing much else. Don't confuse the GT350 with the GT500. 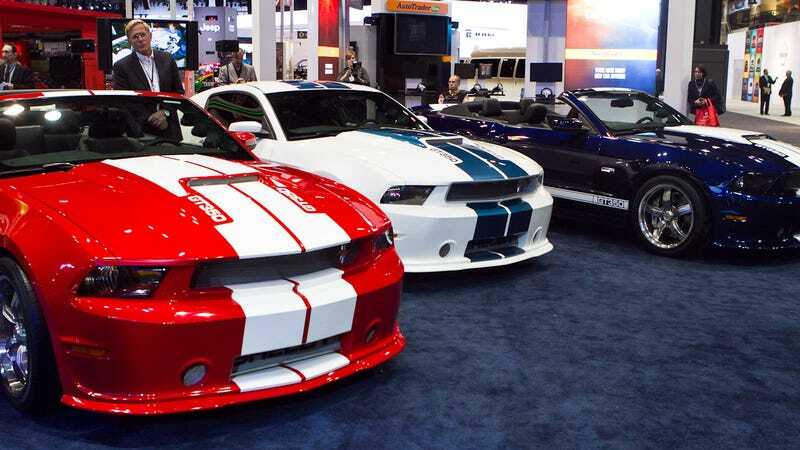 The latter is a purpose-built Supercar killer built by Ford, the former's a Mustang GT upgraded by Carroll Shelby's company with a supercharger, Borla exhaust, and a bunch of parts from the Ford Racing. Because it's graced with the Carroll Shelby name they manage to charge up to $34K over the price of the regular 'Stang for the 624-hp Supercharged version. What's more ridiculous? They charge $26,995 for the naturally aspirated version. As mentioned, for 2012 you can get a convertible option and they've added red-and-blue versions because there's nothing more American than overcharging people for a bit of history.